I visited a small rescue zoo called Austin Zoo & Animal Sanctuary this past weekend. 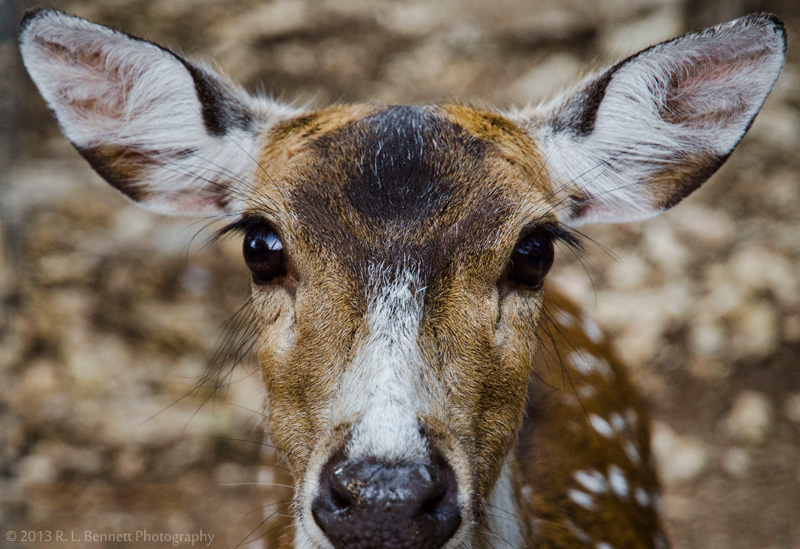 It was raining pretty hard by the time I got around to the Axis Deer enclosure, but the way this lovely little doe was looking at me, I knew I had to get a shot before I fled for cover. As I inserted my lens through the fence to get a decent shot, she was kind enough to stare down my camera and brave enough to hold her ground as I edged closer and closer. You can see and read more about the animals I encountered at the zoo here. Taken with a Nikon D7000 and 18-55mm f3.5-5.6 Nikkor lens. Click image to enlarge. Enter your email address to subscribe to my site and to receive notifications of new posts by email.